I am writing nice and early because I am hoping I won’t have an opportunity at the middle of the day. You see, we REALLY need to work on Mr. Ink’s old house. And he doesn’t want to. I don’t blame him, but we are working with a one week deadline now, so it must be done. We got a big load to the dump yesterday, but I am pretty sure we’ll be renting a dumpster for next weekend. I do suspect, however, that this entire week will be a broken record of my nagging. And helping. So, then a few pictures from yesterday. I think I mentioned I had a lot to get done yesterday as well. I did! It even included time at the shop getting my oil changed, and spinning during that too. 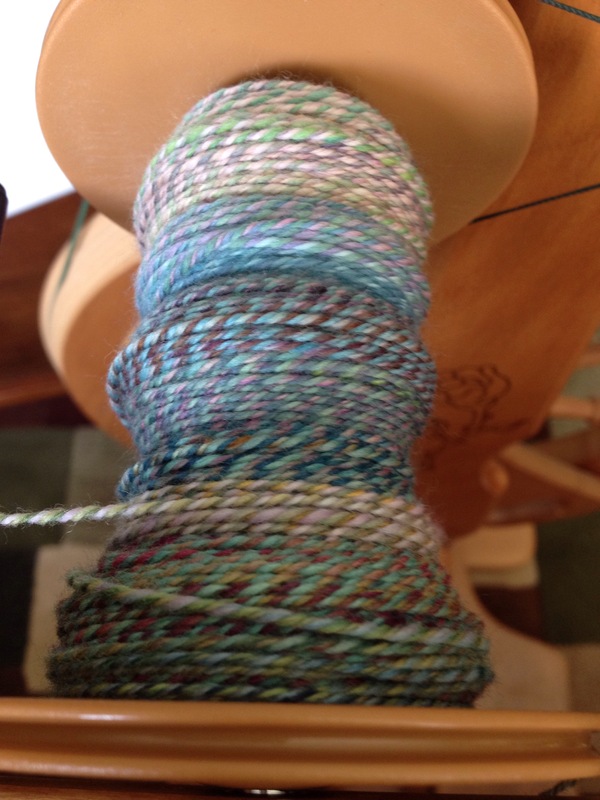 Here’s a plying picture of the malabrigo nube I’d been working on. I do have a full skein of this now, but it’s still wet so no pics until tomorrow. It turned out quite lovely, and now I am on to my next project, the camel/merino/silk combo I worked on during my work breaks last week. 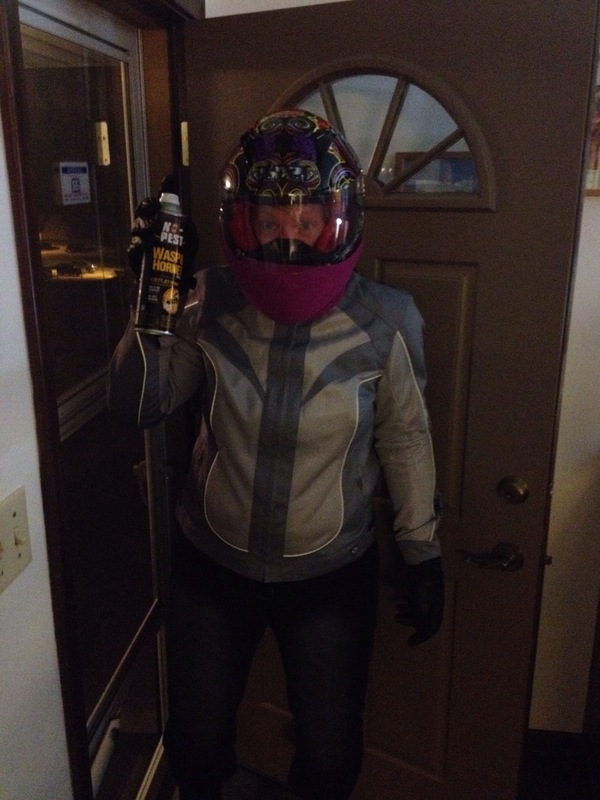 Another chore I tackled last night was eliminating a wasp nest from my garage door. I’ve never done such a thing before, so I was a bit nervous. Miss Bug asked me how I was going to do it, and I told her I was going to use protection. Despite the high heat index, I was fully covered. And it ended up being anticlimactic, those wasps didn’t move at all. Tonight we have to remove the nest itself. 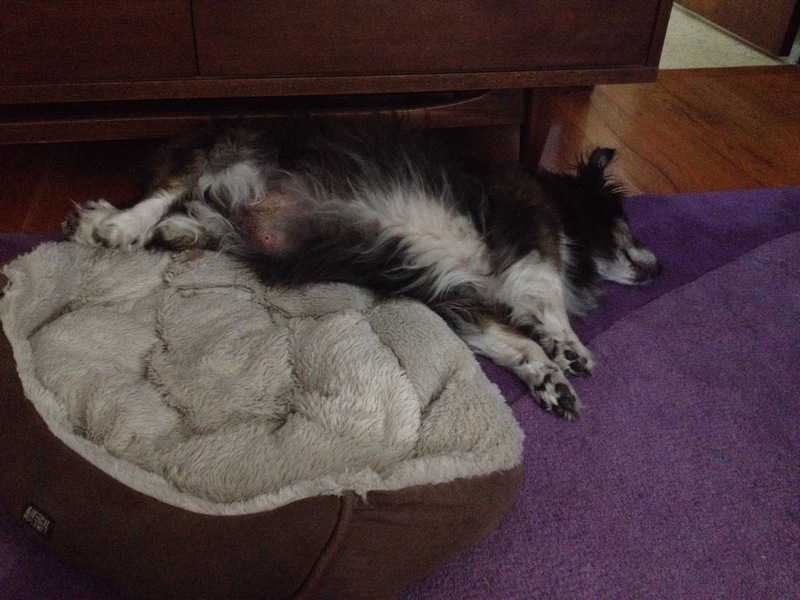 And then one cute picture of an elderly dog who slept so hard he fell out of bed. I wish I had slept equally as well! Happy TdF spinning my friends! Ah to sleep that soundly, but then it might hurt in the morning! Love the plied yarn so far, can’t wait to see the skein! Yes, he’s always quite sore in the morning, and when he did wake up, couldn’t get himself out of that position without having the bed moved for him. But man, he was cute! You are so brave. I would have chickened out and hired someone to get rid of the wasps. It’s funny, the spray says that I need to wait 24 hours before I take down the nest. Of course now faced with taking down the nest, I am nervous. This makes no sense whatsoever.